The MagicInfo suite works together to create an easy, integrated environment for you to manage your digital signage. Whether you have content ready-to-go or you need a digital signage strategy, we can accomodate your specific workflow and develop the perfect solution. 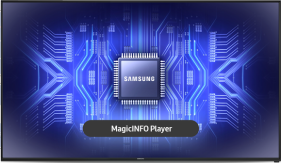 We utilize Samsung’s MagicInfo server to manage devices and content. 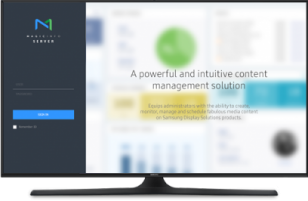 Developed exclusively for Samsung Smart Signage Platform (SSSP), the software meshes seamlessly with the devices to manage media, playlists, and schedules. We utilize Ping HD’s solutions to provide affordable, scalable, flexible and innovative digital signage solutions. Structured for complex applications, the Samsung SMART Signage Platform (SSP) connects you with their partner ecosystem to help you build a custom-tailored solution. This open and integrated player side media platform, allows us to streamline deployment and manage content remotely across multiple displays and locations. This new generation of SSSP 6.0 leverages an evolved experience of multimedia and hardware management to Samsung’s dedicated Content Management Service(CMS) partners through cloud technology. The new developer tools provided to SSSP partners facilitates development and testing environments. The SSSP 6.0 provides PC-free, all-in-one operations, with the Tizen OS replacing the need for external devices to produce clear, brilliant content.